The U.S. Department of Justice has won the infamous Rosemary Award for worst open government performance over the past year, according to the citation posted on the Web today by the National Security Archive (www.nsarchive.org). The award is named after President Nixon's secretary, Rose Mary Woods, who erased 18 1/2 minutes of a crucial Watergate tape. a mixed overall record on freedom of information with some positive signs (overall releases slightly up, roundtable meetings with requesters, the website foia.gov collating government-wide statistics) outweighed by backsliding in the key indicator of the most discretionary FOIA exemption, (b)(5) for "deliberative process," cited by Justice to withhold information a whopping 1,500 times in 2011 (up from 1,231 in 2010). "Justice edged out a crowded field of contending agencies and career officials who seem in practical rebellion against President Obama's open-government orders," commented Archive director Tom Blanton. "Justice's leading role as the government's lawyer signals every bureaucrat they don't have to stretch as much as Rose Mary Woods to cover up the government's business." "The Department of Justice – which is responsible for enforcing FOIA government-wide – was supposed to be the change agent and role model for President Obama's FOIA reforms," said Nate Jones, the Archive's Freedom of Information Act Coordinator. "But, despite the president's clear instructions, the DOJ has embraced a 'FOIA-as-usual mindset' that has failed to transform the decades-old FOIA policies within its department, much less throughout the government." The Emmy- and George Polk Award-winning National Security Archive, based at The George Washington University, has carried out ten government-wide audits of FOIA performance (see the most recent Knight Open Government Surveys), filed more than 40,000 Freedom of Information requests over the past 25 years, opened historic government secrets ranging from the CIA's "Family Jewels" to the Iraq invasion war plans, and won a series of lawsuits that saved hundreds of millions of White House e-mail from the Reagan through the Obama presidencies, among many other achievements. The Archive founded the Rosemary Award in 2005 to highlight the lowlights of government secrecy. 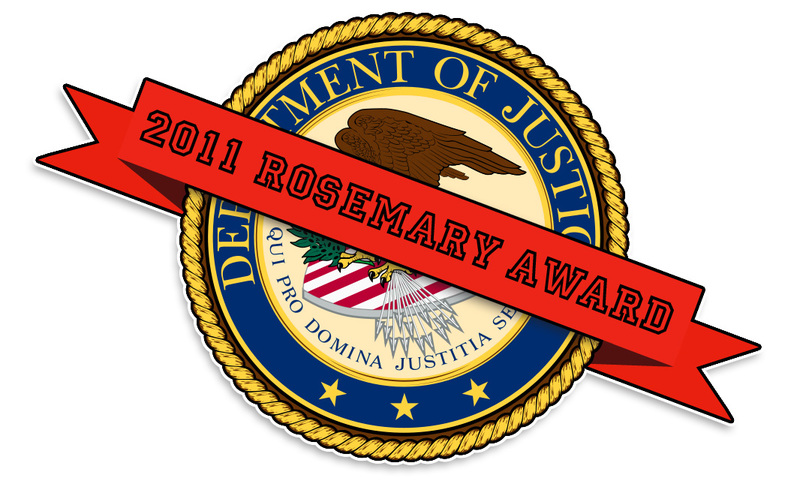 While the Justice Department won the Rosemary Award as a team effort, the Award citation recognizes several individual dubious achievements for putting Justice over the top in the award contest. According to the citation, the single individual in 2011 who did the most to stomp on President Obama's open government message was career Justice Department lawyer William M. Welch II. Welch led the prosecutions of government whistleblowers as "leakers" under controversial Edwin Meese-era interpretations of the 1917 Espionage Act. Welch's Ahab-like pursuit of National Security Agency whistleblower Thomas Drake succeeded in ruining Drake's life and bankrupting him, but ultimately collapsed ignominiously in 2011 into a mere misdemeanor plea under the reality that the information at issue was not justifiably classified – meaning its release did no damage to national security. Close observers of the government's security classification system were not surprised, since massive over-classification is the norm. Not chastened in the least, Welch doubled down his overreaching selective prosecutorial strategy by going after CIA whistleblower Jeffrey Sterling, attempting to corral New York Times reporter James Risen, and even now is appealing the district court's remonstrance of Welch's take-no-prisoners strategy in that case. Welch has earned his reputation among journalists as an overkill prosecutor, heedless of the collateral damage from his actions on the First Amendment or on accountability in government. The individual who launched Justice's successful campaign to win the Rosemary Award was career Solicitor General staffer Anthony Yang, who tried to convince the Supreme Court during oral arguments on January 19, 2011 (two years after President Obama's order for a "presumption of openness") that exemptions to the U.S. Freedom of Information Act deserved the most expansive possible reading – "exemptions are to be given meaningful reach." Yang meaningfully reached for the Rosemary Award by responding multiple times to increasingly incredulous questions from Justices Scalia (no friend of the FOIA) and Sotomayor on this point. Scalia asked, "Our cases assert, do they not, that the exceptions to FOIA should be narrowly construed?" After some back and forth, Yang said flatly, "We do not embrace that principle." Yang was speaking for the Justice Department, and indeed, for the government as a whole, in direct contradiction to President Obama's stated polices on open government. A month earlier, in December 2010, Yang had made similar oral arguments in the Milner case, supporting almost total discretion for the government in deciding how to apply exemption (b)(2) on internal personnel policies and rules. Yes, deferential federal courts had previously granted that discretion, and Yang was simply arguing for the prerogatives of his client, in that case the Department of the Navy, which was trying to withhold maps of potential explosives damage from neighbors of a naval base. But the persistence of business-as-usual legal arguments at the highest level of the Justice Department – despite clear orders for change from the White House – points beyond the mere weight of legal precedent, to the vast inertia and vested interests of the permanent bureaucracy. As Justice Kagan wrote for an 8-1 majority in theMilner decision, if Yang's argument carried the day, the Justice Department would have turned the FOIA from a disclosure statute into a withholding act. The third career Justice Department official who stood out in the past year's bleak landscape of excessive government secrecy is the person ostensibly charged with actually implementing President Obama's day-one pledges for the most open and accountable government ever. Instead, Melanie Pustay, the head of the Office of Information Policy at Justice, has made her mark as the consigliere for agencies that seek to withhold information from the public. In 2011, she presided over the development of a series of proposed regulations – ultimately put on hold after public outrage caught the attention of higher-ups – that would have changed the Freedom of Information Act process in more than a dozen regressive directions – in direct contradiction to President Obama's orders. In the most ridiculed provision, Pustay's regulations would have formalized the practice – first enabled by Attorney General Edwin Meese in 1987 – of allowing the government to lie about the very existence of records sought in a FOIA case. The outcry in the press and from Capitol Hill caused Justice to withdraw that provision from the proposal; but the Department's defense – that such practice had been standard since 1987 – spoke volumes about the business-as-usual approach at Justice. Despite the clarion calls for open government issued by President Obama and Attorney General Holder, the Justice Department's performance on FOIA looks much more like the same-old practice. To be fair (which is not the point of the Rosemary Award), the Department can point to some progress: For example, the new foia.gov web site collates all the agency annual reports on FOIA and should lead to better practice and tracking as the data improves. Pustay's office has organized roundtable meetings with requesters to encourage dialogue that should be the norm across government. And Justice's overall numbers of full and partial releases under FOIA are up from about 44% to about 56% of total requests processed. But the canary in the coal mine is not singing any more. The Department cannot point to a single case of agency withholding that it has refused to defend under the new guidance from the Obama and Holder memos in 2009. The Department's litigators are using the same boilerplate they used under the George W. Bush secrecy orders. And the leading single indicator of the change requesters expected has now turned around completely: After two years of decline in Justice's use of the entirely discretionary "deliberative process" exemption, the 5th exemption to the FOIA, in 2011 the Department's use of (b)(5) went back up, from 1,231 the previous year, to 1,500. This is the exemption that should have fallen off the cliff, if the Department was serious about its own Attorney-General's directions, and if Pustay's office was providing real guidance to its peers. Even though currently on hold, no doubt these regressive regulations still lurk in the Office of Information Policy word processing files, ready to leap out and bite unsuspecting fifth-graders the moment that office is let off the leash. A fee waiver for all students at any level. Specifically instruct that new media, bloggers and tweeters qualify for fee waivers. End the use of all discretionary (b)(5) exemptions. Mandate that the DOJ FOIA program collaborate with the government-wide FOIA portal, led by the Environmental Protection Agency, Department of Commerce, and National Archives. Confront the "consultation black hole" by requiring that DOJ FOIA officials periodically check up on the status of all documents sent to other agencies for consultation, coordination, or referral. Eliminate the need for repeat FOIA requests by proactively posting all documents released to FOIA requesters digitally on the web. Who's in Charge at the Justice Department? Of course, having so many individual Rosemary achievers from a single department raises the question, who is minding the store? In such a kindergarten, where are the grownups? Back in March 2009, Attorney General Holder followed up President Obama's day-one orders for open government with a new Attorney-General's memorandum ordering a presumption of disclosure. Yet in 2011, Holder and his Assistant Attorney General for the Criminal Division, Lanny Breuer, presided over the debacles that won their Department the prize for worst open government performance, including the pernicious use of the 1917 Espionage Act to the transmission of information between officials and journalists (not foreign government espionage) – despite the obvious First Amendment implications of such overreaching and selective prosecution. Through their sponsorship of pit bulls like William Welch, their failure apparently even to read Anthony Yang's Supreme Court briefs claiming maximum reach for FOIA exemptions, their selective prosecutions threatening the First Amendment, and their failure to apply their own claimed commitment to open government, Holder and Breuer have layered black blotches on the public record and cinched the Rosemary Award for their department, which, as the government-wide enforcer, should have been a role model instead. The Central Intelligence Agency submitted a double entry for the Rosemary contest. In September 2011, Joseph Lambert of the CIA rammed through without notice or comment a new set of regulations restricting the Mandatory Declassification Review process. The regulations now charge exorbitant fees for processing even if no documents are ever produced, and thus deters requesters and undermines one of the few secrecy reforms that is working – the interagency appeals panel that by ruling for requesters 65% of the time, provides yet another objective metric of the massive over-classification of information inside the government. Perhaps aware that the Justice Department was producing even more creative regulations, CIA then compounded its folly the same month, when the CIA's Information and Privacy Coordinator, Susan Viscuso, informed requesters that the entire work product of the CIA's new climate change analysis center was classified and therefore unreleasable to the public – which, if true, means the CIA's analysis of a critically important global issue is essentially absent from the public debate. The Department of Homeland Security made a late surge in the Rosemary race, when Marshall Caggiano, a staff lawyer at DHS,claimed that a finished report from the outside expert JASON group had to be withheld under the 5th exemption to the FOIA because it was "deliberative process" material, and only reversed that claim on appeal when the requester notified DHS that a copy of the unclassified report had already been obtained elsewhere. Then a senior lawyer at the DHS agency for Immigration and Customs Enforcement, Susan Mathias, attempted to overturn a two-decade old D.C. Circuit opinion on favorable fee treatment for representatives of the news media, by claiming for herself the power to decide what requests were newsworthy and what were not. When the CIA tried this gambit in 2008, a federal court slapped them with a negative ruling and ordered them to pay attorneys' fees; ICE is simply inviting litigation with this retrograde policy. The U.S. Central Command took an unclassified report, reported by the Wall Street Journal in May 2011, about how Afghan Army soldiers were increasingly attacking NATO and American troops in Afghanistan, and classified the document at the SECRET level (serious damage to national security), thus highlighting the document (which remained on the Internet in its original unclassified form) and ensuring that it would be front-page news when reporters noticed. The U.S. Agency for International Development attempted to throw a burka over an unclassified Inspector General report, posted on the Internet, about AID's failure during the Kabul Bank collapse. "At the time our report was issued, it was written utilizing information from non-classified sources," said James C. Charlifue, the chief of staff of the USAID Office of Inspector General. "After our report had been issued, USAID subsequently classified two documents that were cited in our report. This action resulted in the report becoming classified and we removed it from the web site," he told Secrecy News. 2006: the Central Intelligence Agency (for the biggest one-year drop-off in responsiveness to FOIA requests yet recorded). The Rosemary Award is named after President Nixon's long-time secretary Rose Mary Woods and the backwards-leaning stretch – answering the phone while keeping her foot on the pedal of a tape transcription machine – that she testified caused the erasure of an 18 1/2 minute section of a key Watergate conversation on the White House tapes.